Brown Paper Tickets offers live sales and support 24/7 for ticket buyers. (They offer to send reminders, assist in finding the venue if the need arises, or offer to help in any way possible.) For questions about the show or the performers, email Bob at fairwayproductions@att.net. If you care to inquire about becoming a sponsor of the event, contact Phil Michel at pmichel@sjeliz.org. Please do not call St. Joseph's or Union Catholic High School for show tickets or information. Tickets at the door, if still available, are the same price. Cash only, please. The doors open at 7:15 pm. all of whom are outstanding talents in jazz," America's music." 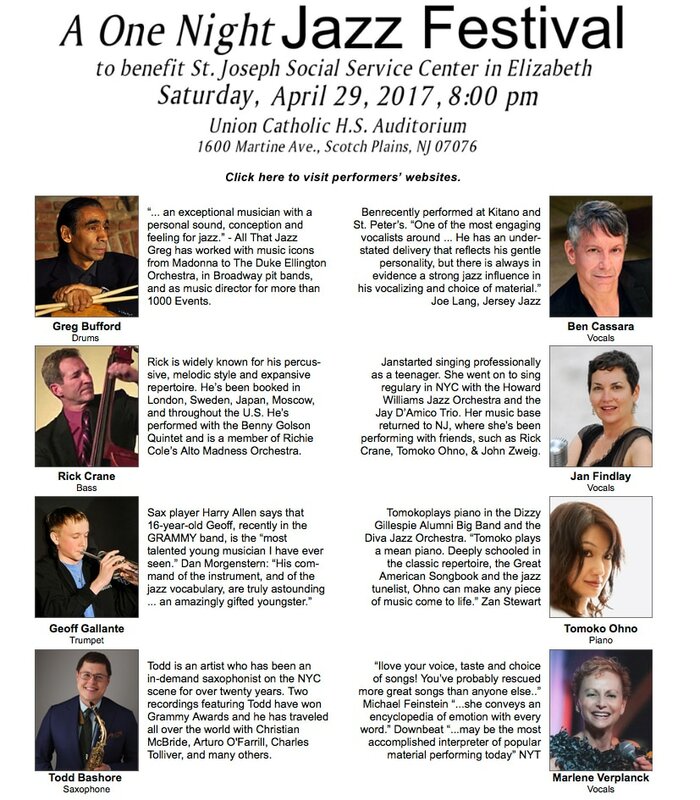 Consider buying your tickets soon, supporting both live jazz and a most worthy non-profit organization...and treating yourself to a wonderful evening of entertainment.